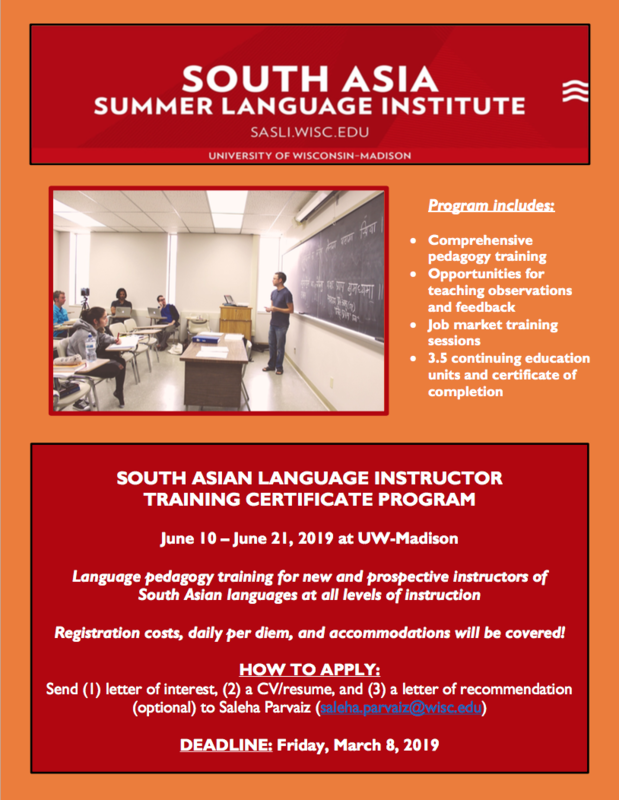 UW Madison's South Asia Summer Language Institute (SASLI) will be hosting a 2-week language pedagogy training certificate program this summer. Participants will earn continuing education credits through UW-Madison's Division of Continuing Studies, and they will also receive a certificate of completion. Registration costs, daily per diem, and accommodations will be covered! Who: New and prospective instructors of South Asian languages at all levels of instruction What: Certificate program with comprehensive pedagogy training, opportunities for teaching observations and feedback, and job market training sessions Where: University of Wisconsin-Madison When: Monday, June 10 - Friday, June 21, 2019 Deadline: Friday, March 8, 2019 How to apply: Send (1) letter of interest, (2) a CV/resume, and (3) a letter of recommendation (optional) to Saleha Parvaiz (saleha.parvaiz@wisc.edu).